El Pulpo Mecanico was built in Arcata California, Humboldt County. Designed and built by Duane Flatmo along with his friend Jerry Kunkel who masterminded the electrical systems and flame effects. The "El Pulpo" is a combination of art and technology melded together. We built this knowing that it would be fun to watch as the giant cam spun up through the center moving the tentacles and eyes in and out while fire spewed from the tentacles and head. No hydraulics or computers were used in this contraption. 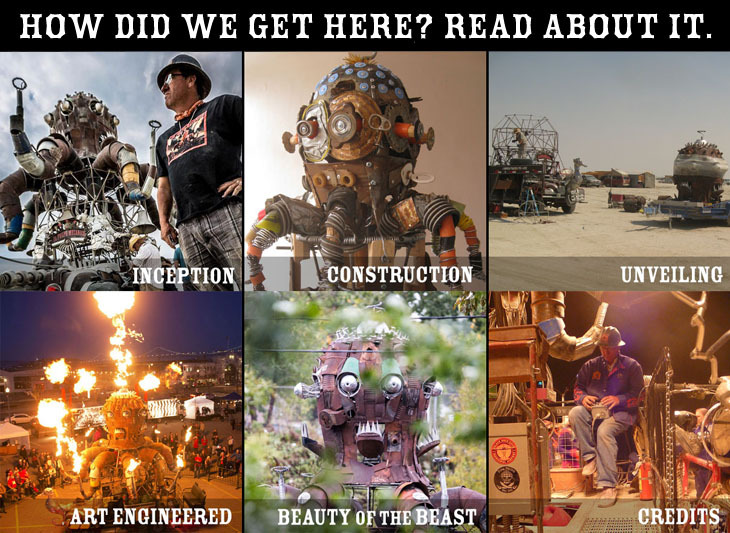 We built the sculpture primarily out of recycled and used junk found at our local scrap yard. A special thanks to Bonnie Connor who worked out a trade with us to have full access to her wonderful place... Arcata Scrap and Salvage. The truck we started with, was a 1973 Ford 250 4x4 donated by Jack Freeman of Eureka. The project took three and a half months to complete with the help of many friends. Bob Thompson, Greg Ester, Brian Slayton, Carl Mueller and Lucas Thornton all helped on the project and we thank them!